creation | Where Did You Find God Today? 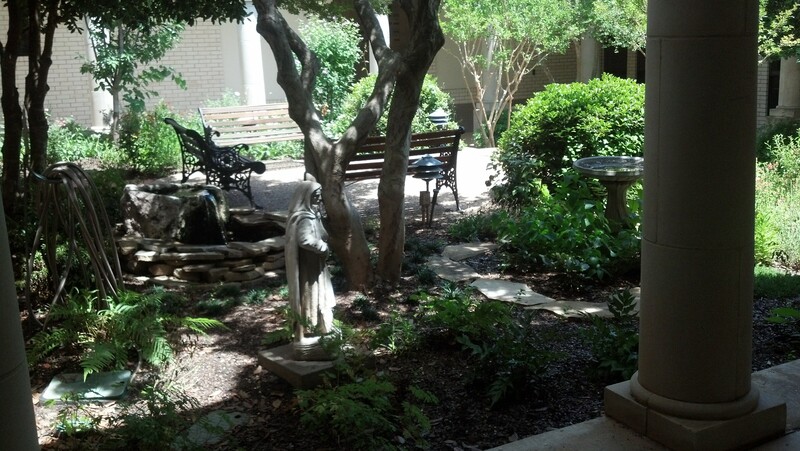 The church where I work has a prayer garden with shady trees, lovely flowers and a trickling fountain. So, of course it attracts all sorts of God’s creatures. From my window, I can watch an never-ending drama of nature unfold as the seasons pass. Take the bugs, for example. In late April and early May, black beetles were everywhere, even inside. You had to watch where you stepped. Then in late May when the temperature soared, the mud-daubers woke from their hibernation and began building cylinder mud cones everywhere. June bugs next made an appearance as did an amazing ground hornet that looked like a bee on steroids but was quite benevolent and totally oblivious to humans. The scorching summer has now brought grasshoppers and the lulling hum of katydids. How awesome our God is to orchestrate this bug cycle. Though not all pretty and at times annoying, each has a time and a purpose unto heaven, as the verses in Ecclesiastes say. It helps me to realize that there will be different times in my life. Something will appear, perhaps just for a season. It may be a person, a book, a song, or a tidbit of wisdom gleaned from a passage in the Bible I never noticed up to that point. It may not be something I like. But it all flows from the One who knows all and has perfect timing. Lord, teach me to be in sync with Your plan for my life, and to anticipate each new serendipity that comes, And when things that “bug” me come around, let me see them as lessons You can use to make me into the beautiful creature You know I can be, just as You are daily recreating the garden at this church. Amen.